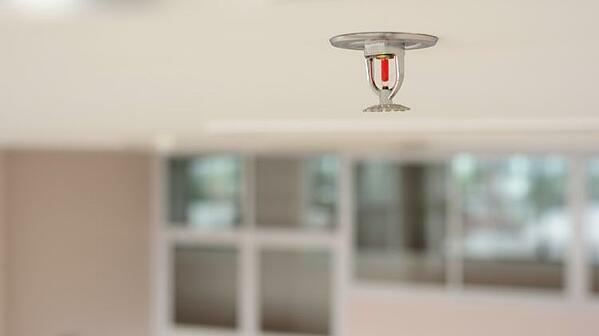 It’s easy to do – taking the nearly omnipresent fire sprinklers and fire protection systems for granted. But these devices are complex and amazing pieces of engineering which are far too often misunderstood and potentially misused, to the detriment of those operating near them. One of the most common and potentially problematic misconceptions people have is the belief that smoke sets off fire sprinkler systems. The simple fact of the matter is: smoke will never set off a fire sprinkler system. The purpose of fire sprinklers is to save property and life from an actual, full-burning fire. It is not an early warning system, such as a smoke detector. Also, as a side note, smoke detectors simply warn you of smoke and cannot actually extinguish the source of smoke – another common misconception. What DOES Set Off Fire Sprinklers? Fire sprinkler systems are actually quite sophisticated, and are designed to be heat sensitive so that sprinklers only activate when the temperatures rise to fire-induced temps, usually somewhere between 155 to 165 degrees Fahrenheit. Furthermore, sprinkler heads are activated individually – in other words, if one is triggered, it will not automatically set off the entire building’s system of sprinkler heads. This is important, as it prevents massive and unnecessary water damage. It ensures that only the necessary sprinkler heads that are in the immediate vicinity of the fire are activated. Often, only one or two sprinklers are needed to successfully contain and extinguish most fires. Either a small glass bulb containing heat-sensitive liquid or the less common fusible metal link are what allow a sprinkler head to be heat-activated. These can be designed to respond to specific temperatures, with the liquid in the bulbs being colored in accordance to the heat that will trigger them. For instance, the most common sprinkler head is designed with a red glass bulb, which means it will activate when the temperature reaches 155 degrees Fahrenheit. Others may be more or less sensitive. When temperatures rise to the designated limit, the liquid inside the bulb will expand and shatter the bulb, triggering the mechanism that will activate the water sprinkler head. So, only fire-related temperatures can trigger fire sprinklers, and furthermore, only the sprinkler heads that are in the immediate area of the fire. This makes fire sprinkler systems highly efficient and ensures that only the area with the fire will be doused with the water necessary to suppress and extinguish the fire. How Are Your Fire Sprinklers? If you own or manage a property requiring fire sprinklers and smoke detectors, it is vital that you ensure everything is in working order. Furthermore, it is important that you do not become too relaxed – just because you have a sprinkler system, doesn’t mean you can let your smoke detectors slide. Smoke detectors can provide the early warning that allows actions to prevent a fire in the first place. Not sure if your building is sufficiently protected? Give the experts at Koorsen a call today. With over 70 years in fire protection and a mission for excellence, they can provide the inspections, maintenance, repairs and systems you need to keep your property and people safe.